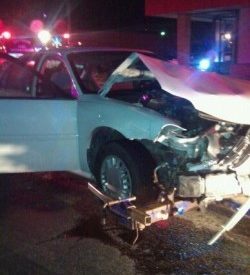 A Tuesday evening collision is the result of a vehicle traveling the wrong way on a one-way street, officials said. Police responded to NW Fourth Street near the Post Office late Tuesday night after a person without a driver’s license was traveling the wrong way and caused a severe collision. The incident happened at approximately 9:23 and two citations were issued, one for no driver’s license and the other for driving the wrong way on a one-way street. According to an anonymous source, a juvenile girl was driving for her first time and ran a stop sign. As a result, the vehicle collided with an oncoming vehicle at a high rate of speed. Information was not immediately available as to any injuries, but Guymon Police confirmed there was an ambulance run.